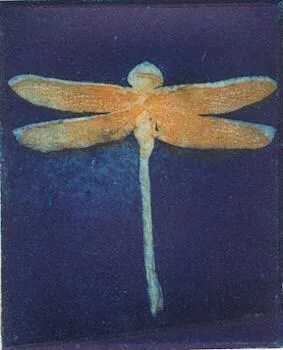 description: a series of etchings, using various techniques, by Australian artist Christine Porter, that explore the symbolism and beauty of the ubiquitous dragonfly. Inspiration: My friend Di van Dorrsen suggested the subject but I couldn’t work how to represent, in the permanence of zinc and copper, something as fragile and ephemeral as a dragonfly. Eventually I became the dragonfly flitting about trying everything, until a whole series of images resolved themselves suddenly, in a rush, using many different techniques. Research: I discovered the dragonfly’s entomological peculiarities: its 30,000 lenses, its wing speed, its pre-historic ancestry. How its life span includes a dramatic mid-life transformation from earthbound to airborne. How, living as it does, hovering between air and water, it appears to commune with what would drown the rest of us. I found how cultures all around the world had applied supernatural and symbolic interpretations to its existence. Some say it would come during the night and sew up the mouths of the ill speaking. It had been informing my culture all along and I’d hardly known it. Titles: Each piece in the suite refers to some part of the dragonfly’s mythology or physicality. The collective title, the dragonfly diaries, relates to its peripatetic habit. It implies a transformative journey recorded on a sun-spun wing tip, the same wing abandoned days later – evidence of the dragonfly’s perilously short, (though, I soon discovered, symbolically imperative) life span. Exhibitions: ‘Moondreamer‘ was selected as finalist in the 8th British International Miniature Print Exhibition which toured the UK 2012-2014. Or use the ADD TO CART button to add the object immediately to your cart. OR if you would prefer not to shop on-line contact Christine directly. Description: While the Dragonfly Diaries were being created a small series of similar etchings evolved as a result of a chance encounter with two etching and printing techniques. There are plans for more in this series, but the drawing board remains laden with such promises. Inspiration: My garden here in the humid north coast of NSW grows anything: I inherited established trees and shrubbery going back half a century. Despite my haphazard gardening style it continues to flower and fruit at apparently random intervals. Around me, in my garden, I see change in motion: the birds and insects that live here, or pass through: the annual re-appearance of flowers; trees’ seasonal transformation. It seems those changes are an indicator that there is life here. In the meditative, constantly moving stillness that is my garden, I saw a flower. It turns and I can feel it quietly looking back at me.